The long weekend – it’s an oasis of relief from the hourly, daily and weekly grind. When a long weekend comes, and let’s be honest they don’t come often enough, we are instantly filled with joy and an overall sense of relief. So what are your plans for the long weekend? That question always seems to come with it an expectation of something grand. “Maybe a bit of gardening.” Ahhh, nah. No way does that pay the respect due to the salvation that is the long weekend! So my answer to “what are your plans for the long weekend?” becomes “well, let me tell you – it’s none of the above”. I am going to travel away with my best friends and spend the weekend relaxing and having fun, before I return home to enjoy the city and rejoin the slave trap that is the 9-5, or as it’s now more commonly known, the 5-9 yikes! On a long weekend it is standard policy for any Aucklander to get the heck out of Auckland. We love and live our city every day and I think Auckland is one of the best places in New Zealand (the world?) to live, yet we take any chance we can get to leave it. So my weekend will in-part be about a night journey away. I am determined not to find myself stuck in the hell that is Auckland long weekend traffic so we will be strategic and attempt to out manoeuvre the masses by selectively choosing the most opportune time to travel and that importantly gets us to the gig in time. My night spent away will be grand and it will include my closest friends, it will be fun, frivolous and jam packed. I will then return to Auckland and enjoy the calm of an empty city. Aaahhh. And just look at it, isn’t the Viper bus just so damn cool! Dressed to impress and partied up, the Leigh saw mill cafe won’t know what’s hit it when the Viper pulls up loaded with work weary and ready to party cargo. What better way to spend a night than with your best buddies, in the most fabulous ride, at a great venue, having a blast. And more importantly we all get to fill the long weekend requirement of heading out of Auckland. No one wants to be the only person in the office to stay in Auckland doing the gardening, catch up reading, shopping or worse. Life is about thinking outside the square, it’s about enjoying the time we are given, its about working hard and playing hard and that’s what we intend to do. I’m taking advantage of the long weekend, I’m using it and squeezing out everything I can. 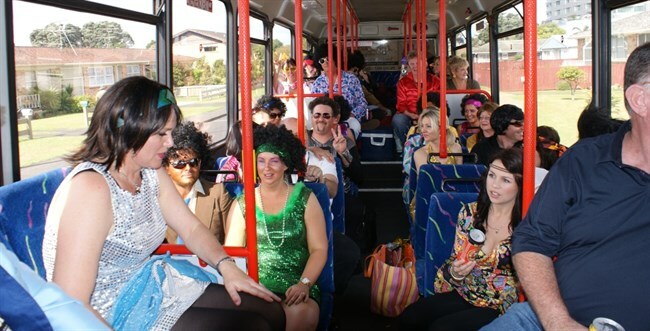 Just up the road (okay correction, highway) are great venues and events, within the city there are wonderful service providers like Party Bus. I live in a city, I work hard and I am proud to be able to indulge and take time away with my friends in this unique way. This time together will be memory filled, it will recharge your batteries, it will be fun-stenance (okay made up word of, fun and sustenance), it will be just what city living ordered and your reward for the seemingly endless daily grind. Oh… and its winter, need I say more, if there’s ever a time to indulge and bring some light to those gray days – it’s winter, the coldness just calls for it. So if you’re thinking of spoiling yourself, having some fun with friends or family, don’t waste time justifying your decision, just say…its winter, it’s the logical thing to do.